See inside the new Piero Lissoni-designed Ritz-Carlton Residences in Miami Beach, which includes a communal arts studio. 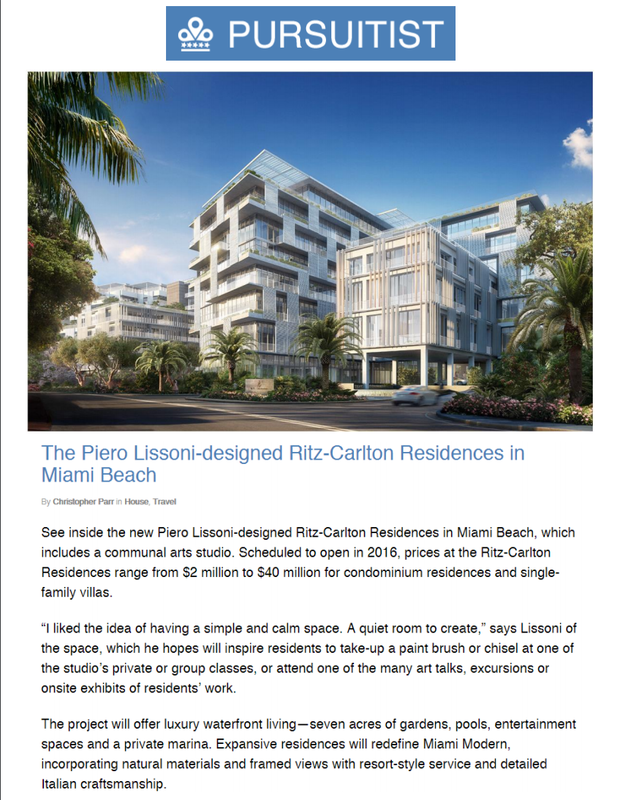 Scheduled to open in 2016, prices at the Ritz-Carlton Residences range from $2 million to $40 million for condominium residences and single-family villas. “I liked the idea of having a simple and calm space. A quiet room to create,” says Lissoni of the space, which he hopes will inspire residents to take-up a paint brush or chisel at one of the studio’s private or group classes, or attend one of the many art talks, excursions or onsite exhibits of residents’ work. The project will offer luxury waterfront living—seven acres of gardens, pools, entertainment spaces and a private marina. Expansive residences will redefine Miami Modern, incorporating natural materials and framed views with resort-style service and detailed Italian craftsmanship.